The FSP CMT520 has a clean and open interior to allow for air to freely flow throughout. 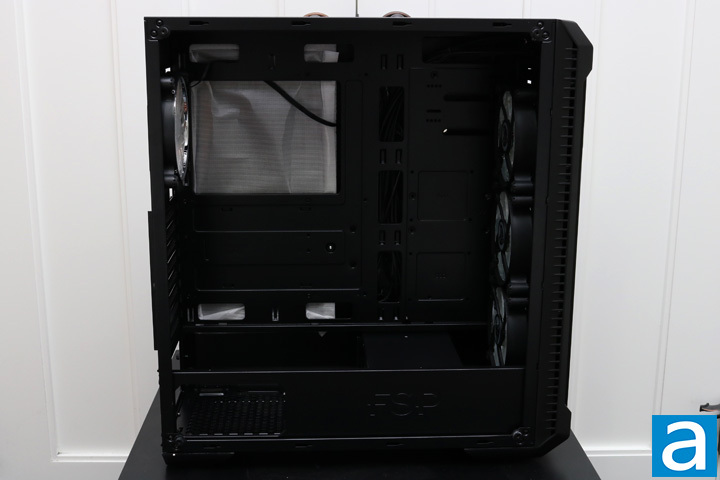 The black color is continued inside, making it much easier to show off the interior components. The absence of hard drive bays at the front means all hard drives need to be mounted at the back. Furthermore, there are three cable management holes right next to the motherboard tray allowing for easy access to all the different spots on the motherboard. There are also three more holes along the top. Two of which are evenly spaced right above the motherboard tray, while there is one further away right above the front fans. This hole is already used for the front I/O cables, but can also be easily used for any fans that need to be routed through. Otherwise, the power supply area is more open than usual. There is a small gap allowing one to show off the power supply, while the area above it is also completely open. FSP does have a reason for this, which I will detail later. The shroud also leaves enough room for large radiators at the front. FSP always makes room for great cooling capabilities at the front, thanks in part to the three 120 mm fans. Instead of having two SSD mounts on the power supply shroud, which the CMT520 lacks, the SSDs can now instead be mounted to the right of the motherboard tray. The FSP CMT520's motherboard area is about the exact same as any other case. There is one 120 mm rear exhaust fan, and right next to it is the motherboard I/O area. 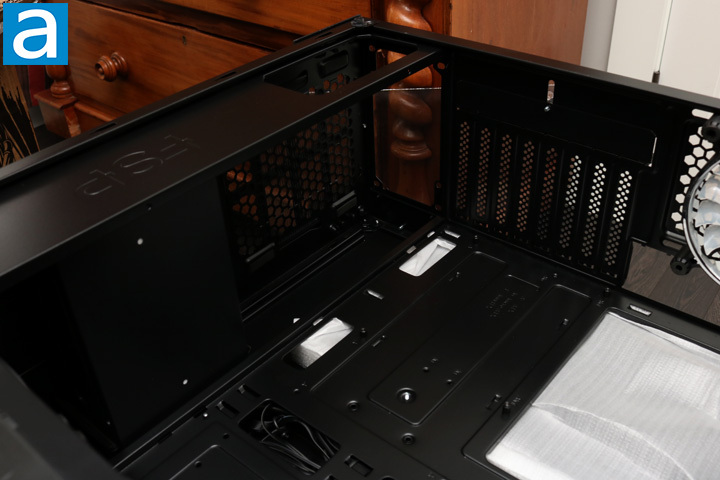 This case can fit any motherboard size from ITX to E-ATX. Above the motherboard tray area, we find room for three 120 mm fans, two 140 mm fans, and a 360 mm radiator. FSP left quite a bit of room along the top to be able to fill this area with cooling options. Adding a radiator and fans to the top of the case would make things really cramped, but there is enough room for it, at least with an ATX motherboard installed. Otherwise, there is a large cutout in the motherboard tray to make it easy to install cooling options. The maximum height for an air cooler on the motherboard comes in at 163 mm, which is ample amount of room for most air coolers. The lower part of the case is quite different from the CMT510. There is no room here for any drive mounts, since it is left completely open. However, FSP includes a halo cover, which is a large piece of dark plastic that magnetically adheres to the case. It keeps the power supply separate from the rest of the computer, creating an independent temperature zone. I am sure one can pull off some cool lighting effects with the halo cover being extremely reflective, but it is not possible with just the included RGB fans. The halo cover is a nice addition, and with the right lighting, can really create an awesome look inside. Otherwise, from this view you can easily see the eight expansion slots, allowing for plenty of extra components in the PCIe slots, as long as they are shorter than 423 mm. The front of the FSP CMT520 is designed almost exactly the same as the CMT510. 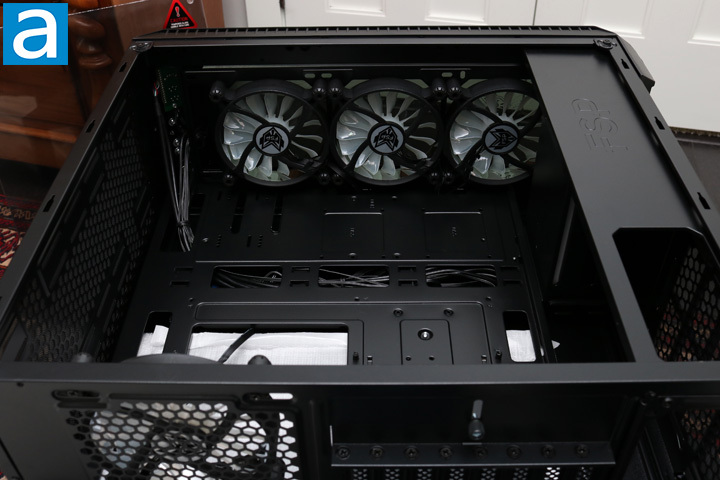 There is room for three 120 mm fans to be installed in the front along with a 360 mm radiator. This should be ample amount of cooling for most enthusiast builds. As aforementioned, this is also where you can mount two SSDs. The front panel I/O has plenty of cables coming from the front towards the back, more than I have usually seen in a case. 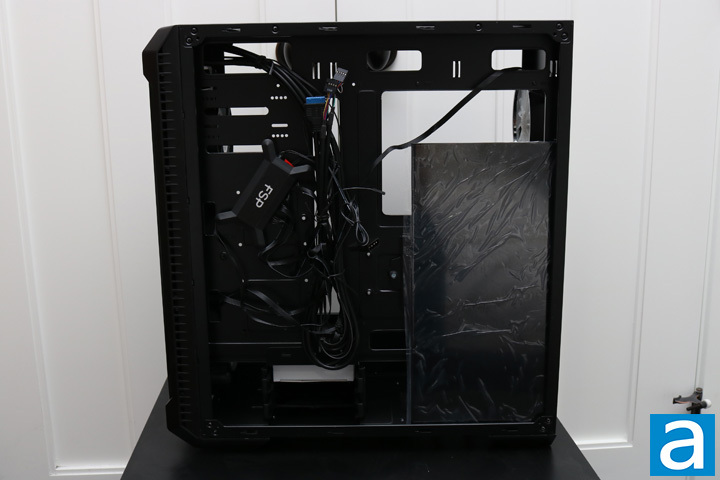 But luckily the cable management leading from the front ensures a nice and clean look for the rest of the case. From this angle, you can also more easily see the holes in the side of the front for air intake. The fans themselves have the RGB LEDs well implemented, illuminating the entirety of the fan effectively. 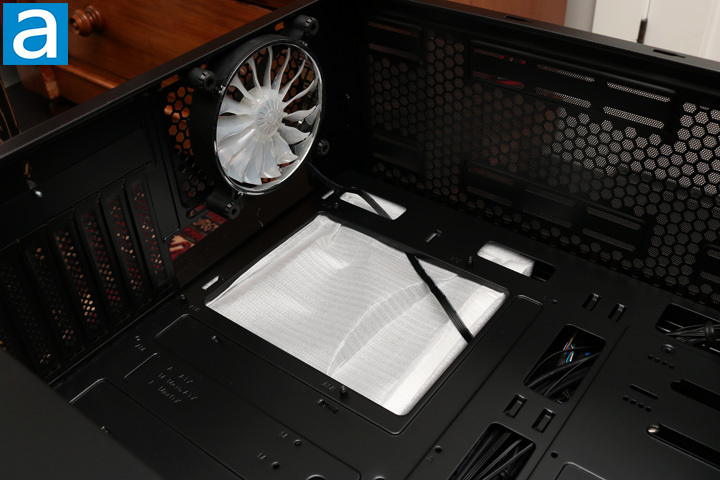 The fans have rubber bumpers where the screws are to reduce vibration noise to ensure quiet operation. The back is slightly more interesting than the CMT510. There are plenty of cable management loops found throughout the back of the motherboard tray. In the back here, you can also see the halo cover before I have it installed. Otherwise, in the power supply area, there are two 3.5 or 2.5 inch hard drive mounts, and there are two more 2.5 inch mounts on the back of the motherboard tray. This provides plenty of storage space, which should be sufficient for most people. FSP this time included a fan hub, which also helps to control the RGB fans and sync them properly. The fan hub magnetically adheres to the case, giving you a bit more freedom when managing all the fan cables.